The Wabbit's paw snuck into Lapinette's and she smiled. "Looks like we're hopping down the very same street." 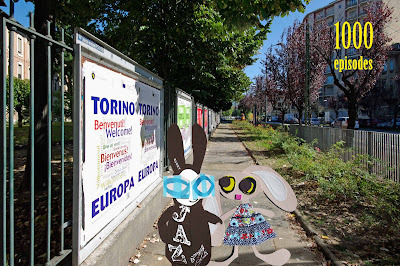 "On the sunny side," laughed the Wabbit. "I prefer my streets sunny side up," said Lapinette. "As do I," nodded the Wabbit. Lapinette hopped with delight. "Do you remember when we first met?" The Wabbit was tentative. "I do," he said, "but it was dark." "That," said Lapinette, "was because you were locked in a luggage locker at the rail terminal." The Wabbit smirked slightly. "I was protecting stolen goods as valuable evidence." Lapinette hopped, skipped and giggled. "You locked yourself in and you'd still be there if it wasn't for my swift intervention." The Wabbit caught a mental glimpse of his skeletal remains. "It was all under control." Lapinette fluttered her eyes. "Your radio had no batteries and there was a railway strike." "Mmm," murmured the Wabbit. "Then it was just as well you had a fur dresser's appointment there." Lapinette thought for a second. "I've still got the scissors I borrowed to lever the hinges." "Are they the ones with the red handles?" asked the Wabbit. "Puce," replied Lapinette. The Wabbit looked relieved because he regularly used bent scissors to prise open containers. "Anyway, what did we get up to after that?" "We had adventures," shrugged Lapinette. "How many, would you say?" queried the Wabbit. Lapinette was emphatic. "A thousand."